Advantages: High quality casting; nice detail; will deliver a very different look for your Tamiya M20. Gaso.Line specialises in 1/48 scale resin kits, conversions and figure sets. 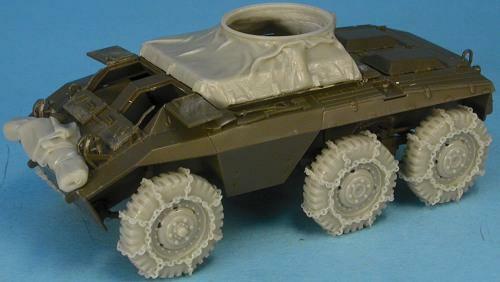 One of their most recent releases is a winter detail set for Tamiya's 1/48 scale M20 armoured car. 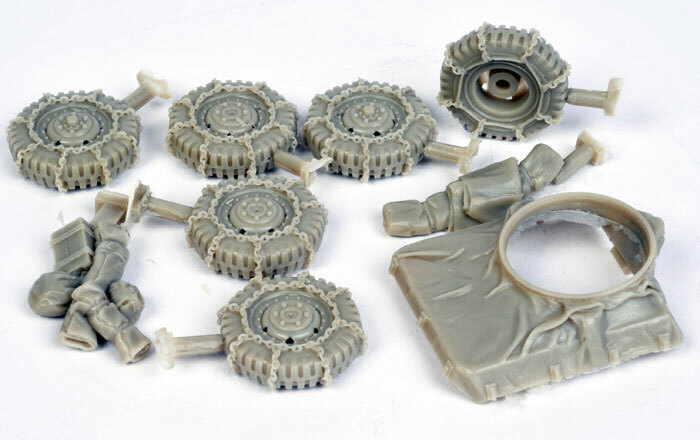 This simple but effective resin upgrade comprises nine parts. There are six wheels with snow chains, two bundles of stowage and a weatherproof covering for the open top of the vehicle. Casting is very good and cleanup should be minimal thanks to the small casting "sprues". Gaso.Line's M20 detail set will deliver a very different look to the Tamiya kit, and will be ideal for adding winter figures in an Ardennes diorama or vignette.